While eyes and vision rank among the most important health issues in children, most young students in Armenia start school without an eye exam. So many of these simple and preventative measures, which we take for granted in the U.S., are almost unheard of in Armenia. Adopting a school in Armenia to provide eye screenings and education is one of the most important things our donors are doing for the country and for each individual child and their families. With approximately 500,000 children in Armenian schools, the AECP Child Blindness Initiative can help Armenia achieve its goals — to provide all school-aged children full eye care coverage through eye screenings within five years. Vision screening, aimed at detecting eye disorders in children early, is the strongest method available for ensuring the long-term health and well-being of children. 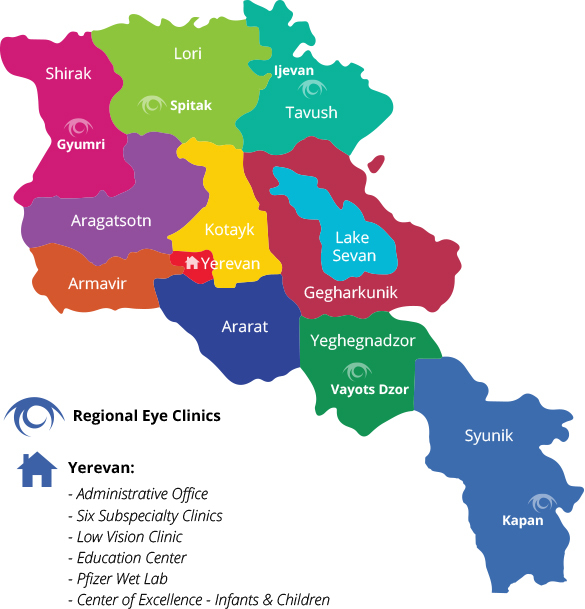 Responding to the increasing number of eye diseases in Armenia, the Ministry of Health aims to “eliminate avoidable blindness and severe visual impairments in Armenia before the year 2020.” AECP’s “Adopt-a-School” program helps the country come closer to its mission. Parents, school officials and children are all very grateful to Harry Bagramian, whose generous donation in 2006 allowed nearly 500 children studying at the Jrarat school to receive eye examinations and participate in an education program to learn how to care for their eyes. Were it not for Bagramian and the Adopt-a-School program, these children would never have had an eye examination. The village of Jrarat, which means “plenty of water,” is located in the Armavir marz. Once a busy industrial village, Jrarat now faces many problems and is one of the poorest areas of the country. Factories that were at full capacity are at a standstill and the primary source of employment is now agriculture. For the second year in a row, Mariam Samoniantz’s ninth grade class at Mesrobian School in Pico Rivera, California, emptied spare change from pockets, purses, and wallets into a large jar every day for three months in order to provide eye screenings and eye heath education for their peers across the globe at Yerevan School No. 105. “I felt good knowing that my small change benefited another Armenian in a significant way,” said ninth grader Nora Gourdikian. The news of the class’s good deed spread around the school and soon, students from all grades began to participate, eventually bringing the grand total to $1,500. Because of the Mesrobian School’s donation, the AECP medical team was able to screen 320 students and discovered that 35 of them had eye problems. The students with eye problems received follow-up treatment, ranging from an extended eye examination, surgery, medications, and/or eyeglasses. These services will be provided at no cost to their families. In addition to the screenings, the younger students were treated to an interactive and educational puppet show featuring Doctor Tesunik and highlighting the importance of eye care. “Doctor Tesunik told us how to keep our eyes healthy and now I want to have healthy eyes,” third grader Silva Yemenyan said. The older students learned about the anatomy of the eye and created colorful eye models, one of which was sent to the students at the Mesrobian School as a gesture of appreciation. Bella Sukiasyan, Schoolmaster of Yerevan School No. 105, was “impressed and touched” that the Mesrobian students gave their extra money to help others in need. She said her students became more attentive to eye care following the visit. More importantly, “they were given an example of compassion and are ready to exercise it themselves,” Sukiasyan said, adding that the seventh grade class at School No. 105 has decided to gather their own money in support of eye screenings for orphans and the elderly in their community.